Construction Porta Potty Rental | Texas Waste Co.
During the pre-planning stages of an up-and-coming construction project, it’s important to consider the sanitary requirements of your job site. To avoid poor working conditions and construction workers leaving the job site in search of clean restroom facilities, look to Texas Waste Co. for your Houston construction porta potty rental needs. We take a custom approach to your sanitation requirements and can pair your next project with the perfect volume and type of construction porta potty rentals. Commercial Construction will undoubtedly involve large crews and because clients, engineers and architects will periodically pay a visit to check project progress, the construction porta potty rentals should be clean and professional looking. Residential Construction is often performed within close range to other homes or neighborhoods, making the upkeep of sanitary levels extremely important. 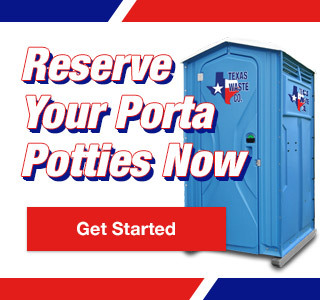 To maintain your company’s positive reputation and professionalism, utilize construction porta potty rentals from Texas Waste Co. to ensure the highest standard of cleanliness. Pipeline Construction projects are large-scale and can take many months or even years before they are completed. For this reason, durable yet professional construction porta potty rentals and strict cleaning schedules are a must to create a healthy working environment for construction crews throughout the duration of the project.